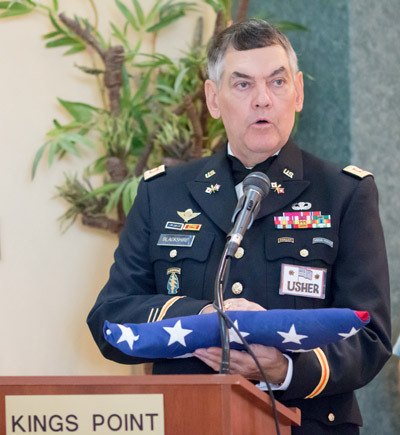 On Monday, May 25, 2015, only minutes before the annual Memorial Day Ceremony would begin to a full house, the Borini Theatre was officially renamed Veterans Theater by the Federation of Kings Point Associations. Since 2007, the theater had been named after Diane Borini, a longtime WCI employee who had managed the building for 25 years. Past, current and future veterans were noted during the renaming ceremony. It was also noted that there could be no better day than Memorial Day to rename the theater in honor of the nation’s veterans. Lt. Col. Charles Conover (USA-Ret) of the Military Officers Association of America officially thanked the community for the honor, and a flag that had flown over the U.S. Capitol Building was presented to the theater by Lt. Col. Benny Blackshire (USA-Ret), through the offices of Senator Marco Rubio.